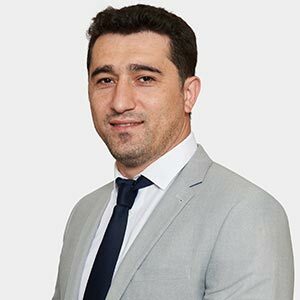 Rauf Khalilov is a solicitor advocate and the branch manager of the Mergul Law Branch of Morgan Has Solicitors. Rauf has an LL.B., and a LL.M. from University College London. Rauf was called to the Bar in 2008, having won the prestigious Harmsworth Scholarship from Middle Temple. In January 2011, Rauf qualified as a solicitor and, since June 2011, he has been a solicitor advocate. Before setting up the Mergul Law Branch of Morgan Has Solicitors, Rauf was a branch manager of an award-winning national firm and the founder of the civil-litigation department at Arlington Crown Solicitors. Rauf receives instructions from lay clients and commercial clients. He is regularly instructed by other firms to do advocacy on their behalf and to deal with complex costs negotiation. Rauf has a broad practice, encompassing all aspects of civil litigation. He has particular expertise in the following areas: personal injury, commercial litigation, employment law and advocacy. Rauf is fluent in six languages: Talysh, Azeri, Russian, Turkish, Persian and English. He also has a basic knowledge of several other languages.